The site thus functions both as a digital archive and as an immersive virtual environment in which users can explore the room, learn about the objects it has contained, and see how the places and faces associated with the room contributed to its history. Anchored by the two virtual tours, the site offers users a deeply contextualized way to navigate the collections: some 400 digital objects, among them the room itself, the objects it has contained, as well as archival materials such as photographs, bills of sale, and correspondence. In addition to exploring the Peacock Room virtually, users can browse the obects in the collection and digitized content from the archives separately. For more information, visit the website. In 1977, Romare Bearden created a series of collages inspired by the ancient poet Homer and his epic story “The Odyssey.” Bearden believed that “all of us from the time we begin to think are on an odyssey.” The Romare Bearden collage app, developed by the Smithsonian Institution Traveling Exhibition Service in conjunction with the national traveling exhibition “Romare Bearden: A Black Odyssey,” was created with Bearden’s quote in mind. With this lively, colorful, and highly engaging app, you can remix works from Bearden’s original series to create your own unique works of art, and express your personal journey. Choose from a variety of Bearden’s backdrops and layer in shapes and forms from other collages. Or cut your own shapes, add personal photos, change the colors of various elements and resize them. You can also add your words and your descriptions. Music played a big role in Bearden’s life and his art, so the app also incorporates sound. While you build your collages, you can mash up audio such as ocean waves, jazz riffs, warriors fighting, or even your own voice. An option to record the user’s voice is also included and can be played back in a loop as the artwork is being created. Save your visual collages and post them to a public gallery–where they can be tagged and revisited by other users–and share with friends on Facebook, Twitter, or email. You can also learn more about the traveling exhibition, Bearden’s life, and the companion exhibition audio tour app. The app was created by GuideOne for the Smithsonian Institute. For more information, visit the iTunes App Store or stop by the VRC to play! The New York Times wrote yesterday of a new start-up called Art.sy, which is digitizing works of fine art to catalog in its database, called the “Art Genome Project”. Their service is similar to Pandora, which mapped a “music genome” in order to encourage user discovery of new songs, or Netflix, which uses algorithms to predict and suggest films and movies a user might like. Art.sy already has 20,000 images in their database, is partnering with galleries, museums, and other cultural institutions to increase their catalog. In addition to traditional subject, genre, and period/movement based descriptions, Art.sy’s team is also tagging works with categories that their system will use “to make connections that are seemingly from different worlds.” These categories include ideas such as “focus on the social margins,” or “personal histories,” and “private spaces.” The system will also search for images that are most similar in terms of composition and color, providing yet another way to access different images. For more information, see Art.sy’s blog or visit the Art.sy website, where you can request a login or browse the beta site. Art.sy is a new way to discover art you’ll love, featuring work from leading galleries, museums and private collections around the world. Art.sy is powered by The Art Genome Project, an ongoing study of the characteristics that distinguish and connect works of art. Art.sy evaluates artworks across 800+ characteristics (we call them genes)—such as art-historical movements, subject matter, and formal qualities—to create a powerful search experience that reflects the multifaceted aspects of works of art. One interesting option is to view works of art in a room, as shown above. This gives a vivid sense of size and scale. Art.sy is still in beta testing, and available only after requesting invitation. Artfinder has partnered with over 400 museums worldwide to provide online access to hundreds of thousands of artworks. After creating a free account, Artfinder users can start building profiles in order to receive personalized recommendations. 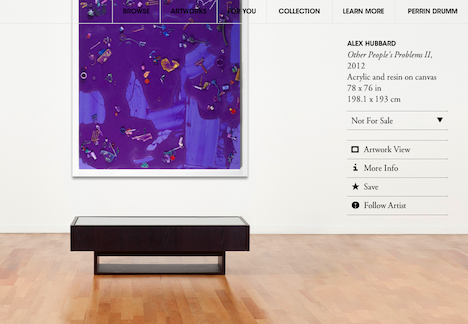 Users can “collect” favorite works and then share their virtual collections on Facebook or Twitter. Right now Artfinder includes many Renaissance, Impressionism, and Baroque images. The selection continues to grow. The Brooklyn Museum’s project Split Second aims to explore how an audience’s initial reaction to a work of art is affected by various factors. It begins with an online, interactive experiment and will culminate in a small installation of Indian paintings from the permanent collection. Split Second begins with a three-part activity that explores the Museum’s collection of Indian paintings… The first stage explores split-second reactions… Next, participants will be asked to write in their own words about a painting before rating its appeal on a scale. In the third phase, participants will be asked to rate a work of art after being given unlimited time to view it alongside a typical interpretive text. Each part of the exercise aims to examine how a different type of information—or a lack thereof—might affect a person’s reaction to a work of art. The installation will open on the museum’s second floor on July 13, 2011. To participate, visit the Split Second website.